Bill Clinton is proud to mention he is wealthy. Now he is asking you to pay off Hillary Clinton’s 2008 campaign debt. So she will be able to run for president when she will be Social Security age in 2016. Republican governors should Let Obama's bureaucrats make a mess of ObamaCare. And block his IPAB board members. The Hill has an interesting story reporting on Republican governors refusing to set up state exchanges under Obamacare — which could save the states money since they are on the hook for costs in excess of federal grants. That means the feds will have to do it on a state-by-state basis, a daunting task even for this highly bureaucratic administration. Plus, it is perfectly legal under the law to engage in such passive resistance. Some liberals say that approach isn’t conservative because, in effect, it allows the feds to run state health care. (As if they care!) I’m not buying. In case anyone hasn’t noticed, HHS already does run health care nationally about issues important to the Obama political coalition — as in free-birth-control rule, with more of the same no doubt coming soon. Indeed, Obamacare was designed to allow the technocracy to create entitlements nationally on the dimes of the private sector, while guaranteeing the employment of ever more technocrats. After an appalling and incoherent Supreme Court ruling and the recent election, it does seem now that utter legal non cooperation is the only way remaining to impede the Leviathan. Here’s another suggestion: Senate Republicans should filibuster confirmation of the soon-to-be-nominated members of the Independent Payment Advisory Board. No board, no IPAB autocracy. Of course, the president might then make a non-recess recess appointment, but that opens any action taken by IPAB to legal attack. So, stalwart Obamacare opponents, time for some good old fashioned passive resistance. Go limp. For those on the political left who object to such blatant obstructionism, I have two words for you: sanctuary cities. Fossil Carl Levin of Michigan, age 78, is expected to run for reelection. Lautenberg would be expected to be replaced by another Democrat. But the other three are vulnerable - average age 71. They might be replaced by younger Republicans. Keep your fossils, Chucky. They get more out of touch with voters every year, but that makes them easier for Harry to control. Bellevue thinks it would be really cool to have a light-rail train coming to it from Seattle. (Or vice versa; they are very sensitive about comparisons to Seattle.) But they want the ugly place to store the trains somewhere else. Indeed, they just can't imagine anyone would think of putting the storage yard where it belongs - in Bellevue! Get it? When you are putting in a new line the best place to store the trains is way out on that new line, not in the central city. To the Bellevue City Council it came natural to pretend the trains would magically appear from no where - pretend for years. But Councilman John Stokes doesn't think the projects necessarily have to be combined — especially if that would delay rail service. "I don't see why there would be any advantage to us delaying those things at this point unless you just don't want the light rail," he said. No place to store the train then no train. 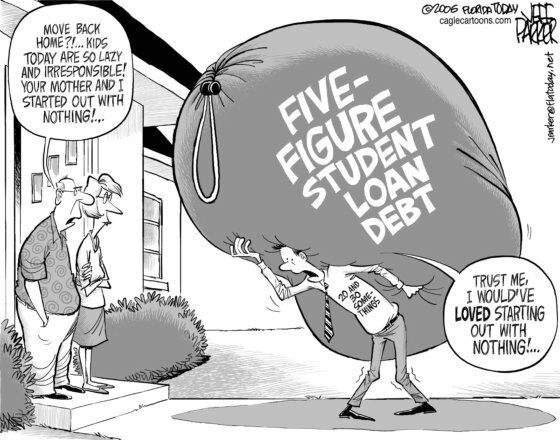 As the cost of college has gone up students borrow more, then the cost goes up more. Because the traffic will bear it. And the federal government is pumping harder and harder. But what if you borrow for classes, then economic reality causes you to drop out? You have college debts, but no degree and no access to the better paying jobs. According to a 2011 study by the Institute for Higher Education Policy, a Washington, D.C.-based research firm, 58% of the 1.8 million borrowers whose student loans were began to be due in 2005 hadn't received a degree. Some 59% of them were delinquent on their loans or had already defaulted, compared with 38% of college graduates. The problem has almost certainly worsened since, as the recession wiped out job opportunities for less-educated workers. The cartoon: Parker in Florida Today. Click to enlarge. But the UN is not happy with mere results; they want more talk! 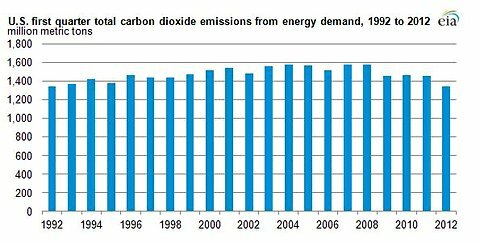 "It's good news and good news doesn't get reported as much,” John Griffin, executive director of Associated Petroleum Industries of Michigan, said of the lack of reporting about the CO2 reductions. "The mainstream media doesn't want to report these kinds of things." But the UN is not happy with these results; they want more talk, more meetings, more declarations. UN climate bureaucrat-in-charge Christiana Figueres hopes Hurricane Sandy will wake up the US and get us to her meetings. Successful results only count when the ring is kissed. 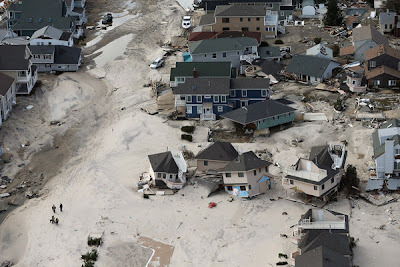 Christiana Figueres, who leads the United Nations negotiations to get governments to reduce carbon emissions in the world, regards Hurricane Sandy as “yet another wake-up call” for Americans to get on board with her climate change policy. Figueres also spoke if international frustration with the United States for failing to sign onto UN global warming initiatives such as the Kyoto Protocol. “[I]f the United States does not strengthen its participation in the global climate regime under the newly re-elected president I think there will be increased frustration with the United States,” she said. 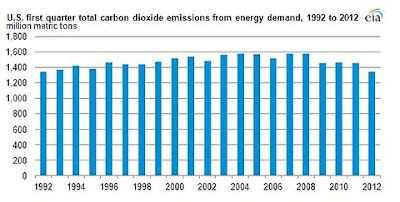 See also: Lowest energy-related CO2 emissions in 20 years. NY Times. The graphic on this page shows that "lowest in 20 years" means just that, comparing the first quarter in every year. This isn't a "Sound" topic, but there is a shortage of reporting good news on the enviro scene. Cross posted on Economic Freedom. Does Bloomberg wear his hairnet when he serves food in NYC disaster areas? BUZZ - Question is based on the false assumption that he does something besides jet off to Bermuda at every disaster. But he will fine your organization if you don't. The New York City Department of Health has been dispatching workers to storm-ravaged areas across the five boroughs as part of an outreach to ensure that volunteers are informed on proper food-handling and other safety issues. But the presence of health officials has caused some confusion as to where the city is drawing the line between advisement and enforcement. Bobby Eustace, an 11-year veteran with the city's fire department tells FoxNews.com that on Sunday he and his fellow firefighters from Ladder 27 in the Bronx were issued a notice of violation for not maintaining restaurant standards in a tent set up in Breezy Point, Queens, to feed victims and first responders. Eustace says that the Health Department worker then checked off a list of violations at the relief tent, including not having an HVAC system and fire extinguisher. “He told us that he might come back to see if we fixed the violations. Of course Nanny Bloomberg's PR people say the volunteers don't understand what is going on. But he set the nanny standard; his employees are following him. Was it Senator Rubio? No. The One himself. Everyone wants bipartisan government - when it doesn't count. Now it is happening in the Washington Senate. Last March three Senate Democrats joined the Republicans to forge and pass a budget. See Olympia's Democrats Throw a Childish Hissy-Fit. And current developments are even more astounding. Republicans and Democrats together might elect the majority leader! Senator Rodney Tom (D - Medina) has put together a coalition of himself, Sen. Tim Sheldon (D - Shelton) and the Republicans. Their third Democrat Jim Kastama of Puyallup didn't run for reelection and was replaced by Bruce Dammeier, a Republican. Now everyone is waiting for the final count of Senator Don Carlson vs. Tim Probst, where Benton is 100 votes ahead, but they are still counting. Tom has the votes to win. Who is opposed to bipartisan leadership? Senator Tom began his Legilative career as a Republican, but switched to Democrat. He has a record of thoughtful leadership on the budget, against the Chopp-Gregoire-Brown "spend, spend, spend. Oh, we were surprised by a deficit!" herd. Want to pay for more renewable energy? Seattleites: Want to pay for more renewable energy? Every month? It's voluntarily. Seattle now gets 96.5% of its electricity from renewable sources. Don't you want it to be higher? I don't see the problem. I live outside the city limits, but we get our electricity from Seattle Light. So a couple weeks ago I got a mailing showing the very, very happy owner of a wind farm and telling me about the problem. "However, while hydro electricity is renewable and low cost, it is not infinite." Oh… It's not infinite. So disappointed. Nothing is infinite! That's life! But we have a lot of it and we are buying wind power also. But now Seattle is allowing its electricity customers to voluntarily pay $3, $6 or $12 per month to keep that 96.5% from falling. No thanks. 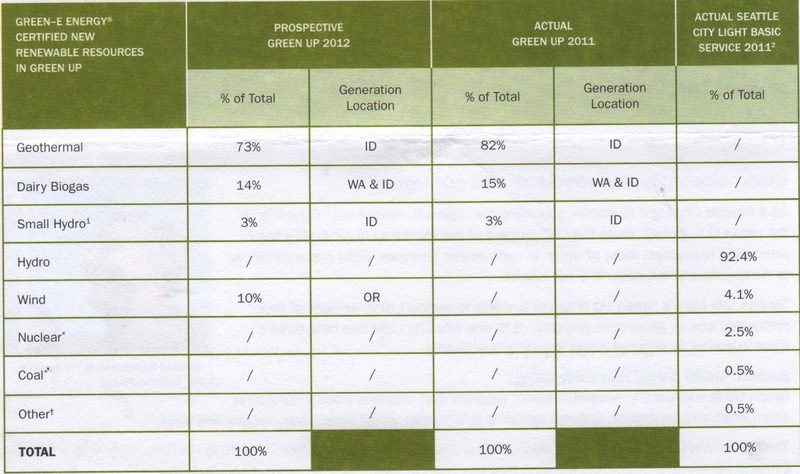 The graphic: the right column shows the power sources in 2012: Hydro 92.4 plus wind 4.1 = 96.5%. Husky star and Seahawks star tight end Jerramy Stevens. Year after year he committed crimes but was let off. Prosecutor Norm Maling protected him by chewing out the prosecutor who brought charges against him. AD Barbara Hedges protected him. Coach Rick Neuheisel - may his name live in infamy - protected him. Judges gave him below-minimum sentences or delayed sentence until after football season..
Today we remember the end of World War I - "The Great War" - and honor all veterans. John Singer Sargent was an American born in Italy who never lived in the US. He was very talented and a hard worker. He got in the sweet spot of painter of portraits for high society - good money and status - and was a huge success. He was asked by Prime Minister David Lloyd George to do a grand painting showing British and American troops together in action. So went to the front in July, 1918, while fighting continued. He was very touched when he saw soldiers wounded by mustard gas. This powerful painting resulted. It's not heroic at all, but shows the pain of war. And… I will place a flag at Acacia Cemetery in Lake Forest Park in memory of Harvey C Roys, Jr., my father-in-law, who attended medical school during WW II, finishing in time to see action in the invasion of Okinawa. [Oops. Didn't post on the day.] The photo: Wall Street Journal. I think this is full size. Camp stove that charges phones!? Yes. 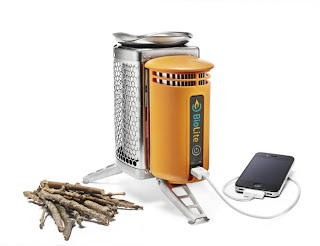 A camping stove that charges cell phones. … And on the ground level, one of the most useful tools to emerge is a genius new spin on the most basic of emergency devices: the campfire. The BioLite CampStove is about the size of a coffee urn. Developed as the hot new toy for hikers, the stove houses a small fire that burns from hunter-gatherer fuel sources—dry twigs, pinecones—and, in addition to warmth, generates electricity for users to charge mobile devices. You can cook on it, too. But with hundreds of thousands of people without power for days following the wrath of Sandy, and many in the New York region still in the dark, a serendipitous new function of the CampStove—disaster relief—has come to light. The Wednesday after Sandy struck, a group of three BioLite engineers packed a car with four CampStoves and a folding table and drove to Lower Manhattan, where there was still no power, and set up a charging station outside Washington Square Park. They made a handwritten sign—“Come charge your phones for free and drink some tea while you’re waiting”—and quickly amassed a crowd of local residents toting dead phones who couldn’t believe their luck. Finally, a way to charge their cells and reopen crucial lines of communication with family and friends. The manufacturer - Biolite CampStove. Note that its fuel is wood you find, not white gas or propane. During the election Obama talked about how oil production increased while he was president [What did he do about it?] and won. Now that the votes have been counted Obama can show his real priorities. He is ruling out oil production in a huge area of the US West. But this is oil shale, not the more common oil formations or the tight rock containing oil where fracking is used. There is little production in oil shale (though it was first used before 1850) because high temperatures are involved and it's not economical at $100 per barrel. So the immediate impact is not so big. The Interior Department on Friday [November 9] issued a final plan to close 1.6 million acres of federal land in the West originally slated for oil shale development. Under the plan, 677,000 acres in Colorado, Utah and Wyoming would be open for oil shale exploration. Another 130,000 acres in Utah would be set aside for tar sands production. The administration and Democrats said that while the plan would curtail what was originally sought for oil shale development, it still opens up a significant amount of land that was previously unavailable for the energy production method. The administration noted the plan pushed forward Friday also included two research, development and demonstration (RD&D) leases for oil shale development. "The proposed plan supports the Administration’s all-of-the-above approach to explore the full potential our nation’s domestic energy resources and to develop innovative technology and techniques that will lead to safe and responsible production of resources, including oil shale and tar sands, which industry recognizes are years from being commercially viable, but require RD&D today," Interior spokesman Blake Androff said. Sen. Mark Udall (D-Colo.) praised the plan, saying the administration exercised the right amount of caution on oil shale development, which has not yet been brought to commercial scale and brings concerns about the amount of water used in the practice. Oil shale development is not to be confused with drilling into shale formations for oil and natural gas. The practice, which involves separating hydrocarbons bound up in rocks, has not been widely executed since Exxon's failed Colorado venture in the 1980s. Bobby McEnaney, senior lands analyst with the Natural Resources Defense Council, praised Interior Secretary Ken Salazar for the proposed final plan. “By significantly reducing the acreage of wilderness potentially available for leasing, Secretary Salazar is laying out a creative, thoughtful and more responsible approach in managing some of our most precious resources,” McEnaney said in a Friday statement. Congressional Republicans are not likely to be as pleased. GOP lawmakers, along with some Democrats, have pushed for more fossil fuel production in the West. Republicans have led the charge, saying Obama’s policies on fossil fuel drilling on federal lands are too restrictive. While Obama notes domestic oil-and-gas production has increased during his administration, Republicans contend that it is activity on private and state land that is driving the boost. They point to this year’s dip in oil-and-gas production on federal land — though levels are still higher than they were during the Bush administration. The Congressional Western Caucus released a report in August to deliver that message. “This proposal will place further limitations on the exploration and development of our country’s natural resources and is yet another example of how this administration continues to stand in the way of North American energy independence," Rep. Ed Whitfield (R-Ky.), the chairman of House Energy and Commerce's subcommittee on Energy and Power, said in a statement to The Hill. Oil and gas lobby the American Petroleum Institute, an ally of congressional Republicans, slammed the decision. Jack Gerard, the group's chief, said Thursday he would take a "wait-and-see" approach to Obama's second term to gauge whether he would live up to campaign rhetoric in which he praised the domestic oil-and-gas industry. Reid Porter, the lobby's spokesman, said Friday's news was a disappointing sign from the administration. “This is another step in the wrong direction that limits development and investment in one of the nation’s most energy-rich areas and goes against a prior government decision that would allow for research and development over a much wider geographical area. Just days after the election this decision by the administration sends negative signals to industry and capital markets at a time when we need to encourage growth and innovation in the U.S.," Porter said in a statement to The Hill. The graphic is from CNN Money. Click to enlarge. Obama adminsitration at its best. You can't make this stuff up. Obama really closed the disaster center due to rain. FEMA disaster recovery centers in Hurricane Sandy-ravaged sections of the city that were supposed to provide assistance to hurricane victims went MIA Wednesday morning, posting signs saying that they were closed due to the approaching Nor'easter. The temporary shuttering of the facilities, which help victims register for disaster relief, as well as city food distribution centers come even as many of those still reeling from the monster storm were not told that they had to leave the battered areas. On Tuesday, Mayor Michael Bloomberg said that residents in the low-lying portions of Staten Island, Queens and Brooklyn were advised to leave ahead of the nor'easter, which could hit the city with 60 mph gusts and several inches of rain Wednesday afternoon, but that the evacuation was not mandatory like the one issued for all of Zone A ahead of Sandy. “We do not believe that it’s necessary to evacuate people,” said the mayor Wednesday. No. Don't evacuate residents. But do evacuate the "disaster responders." Including the food distribution centers. Liberal groups have been intimidating churches for decades, sending letters claiming any church that allows political speech will lose their tax-exempt status - ACLU, Barry Lynn's American United for Separation of Church and State and PFAW. But they are wrong. No church has ever lost its tax-exempt status for political speech. And now the IRS is blowing the whistle on the anti-church bunch. … The left has cried wolf far too many times. No one will come running. Especially not the IRS. That’s because churches, unlike other nonprofit organizations, don’t need a letter of tax exemption from the Internal Revenue Service. Churches are constitutionally tax-exempt simply by virtue of existence. It’s automatic. The only way the IRS could revoke a church’s tax-exempt status would be to disband the church, which, obviously, the government has no authority to do. It’s simple. Pastors, if you get a letter from the ACLU, PFAW or AU, I suggest a singular use for it: bird-cage liner. Keeping all this in mind, something I’ve long expected has finally occurred. A little over a week ago, the IRS ran up the white flag. [The Blaze] That bureaucratic bully we all love to hate announced that, for the indefinite future, it is “holding any potential church audits in abeyance,” for violating its arbitrary “no politicking” rule. Do you think China is about to run away with all the glory - economic and rising military power? People who live there don't agree. They look at all the problems - huge very-low-income population, bad air and other environmental problems, unstable rule by 20 men - and look for a way out. Vote for Rob McKenna because he will be a better governor - Sea Times - National Federation of Small Business - WA Realtors - Veterans - not because a Metro Transit worker was photographed stealing and destroying his yard signs. Seattle Times headline: "Metro warns workers on political activity"
… Paul Bachtel, president and business representative of the ATU [union] local, initially said it appeared the photos had been fabricated by McKenna supporters to discredit Inslee. He later told Thomas in an email that Metro had identified the person with the signs was a McKenna supporter who was was trying to protect the signs and who will “suffer the consequences” for violating Metro policy. … Metro spokesman Jeff Switzer said he couldn’t confirm that Metro had identified the man with the signs because the investigation is continuing. President Bush''s Dept of Energy saw the problems with the NE US electric grid and proposed solutions in 2002. Why didn't Washington work with him to improve on this known problem? Democrats rejected plans to upgrade the electrical grid system in the country because they believed Bush and Cheney were just rewarding "cronies" who helped get them elected (sort of like Obama giving billions to now bankrupt solar companies whose CEOs supported his election). Here (PDF) is the Bush Administration report advocating for upgrades. Too bad its implementation was blocked by Dems in Congress. But the Dem action in this case is just par for the course. Soon after the election of George W. Bush, plans were being hatched to derail any energy plan that the dastardly "oil men" were to send to Capitol Hill, as this 2001 LA Times article reports. Three UW undergraduate engineering students have devised a large-scale 3D printer that uses the high-density polyethylene (HDPE) in milk jugs. They can devise and make all sorts of things - from discarded milk jugs. Amazing people. They are not typical undergrads. Matthew Rogge, after years working in the Peace Corps in third-world countries, saw an opportunity, but needed more technical education, so he went to UW he is 36. They've developed an inexpensive 3-D printer that can turn shredded, melted plastic waste into just about anything. 3-D printers have been around for at least 25 years, although they have become more widely available, better-known and cheaper in recent years. They use computer-aided design to create three-dimensional objects by laying down super-thin layers of a material, such as plastic, much like a regular printer lays down ink. But until now, nobody had figured out how to cheaply build a large-scale printer that used recycled plastic as its raw material, said UW mechanical-engineering professor Mark Ganter. "They're amazing students just to start with," he said of the team. "They have a very clear vision of how to marry 3-D printing into what could help a developing country." The unlikely trio — in addition to Rogge, the team is made up of a former Japanese major and a blacksmith — are all pursuing undergraduate degrees in mechanical engineering. They'll use the $100,000 prize money to build low-cost 3-D printers that can make large objects, including composting toilets and rain-catchment systems, in the mountainous state of Oaxaca in southwestern Mexico, which has a large population of indigenous people. "Not only are we addressing water and sanitation and economic needs, but we're reducing waste," Rogge said of their plans. "There's just so many good things about it." The federal government normally pays 75 to 90%. But Governor Andrew Cuomo says he can't afford 10%. Yes. His state is a mess. State debt is $13,000 per person - highest in the nation. But I didn't make the mess, Cuomo, you did. Go ahead, Cuomo, just continue borrowing. NEW YORK/WASHINGTON (Reuters) - New York state on Wednesday asked the U.S. federal government to pay all the costs of cleaning up and repairing damage from massive storm Sandy that tore through the Northeast this week and crippled New York City. Governor Andrew Cuomo said he is asking fellow Democrat, President Barack Obama, to pay 100 percent of the estimated $6 billion bill, at a time that state and local government budgets remain constrained by a weak economic recovery. That would be a significant change from last year when the federal government covered about 75 percent of the $1.2 billion cost paid by New York to clean up after storm Irene hit the region. I like walking and although mountains were my first love I have preferred beaches for the past maybe ten years. I have never seen a beach on fresh water that you could walk, so this is strictly salt water. We live near Lake Washington. But in less than ten miles I can be walking at Richmond Beach in Shoreline, Carkeek Park in Seattle or Olympic Beach in Edmonds. I get to Richmond Beach and Edmonds once a week when I am in town. Edmonds is very urban and Olympic Beach is only a few blocks long. But there is much more: from its north end and north of the ferry terminal Brackett's Landing Park is paved walking and a beach runs north - I have walked about a half mile north to the next creek. And the walk south, though paved, is along the marina then to Marina Beach park and an off-leash beach for dogs. Wildlife: Edmonds has all the saltwater front and some first-class marshes. So there is a great variety. 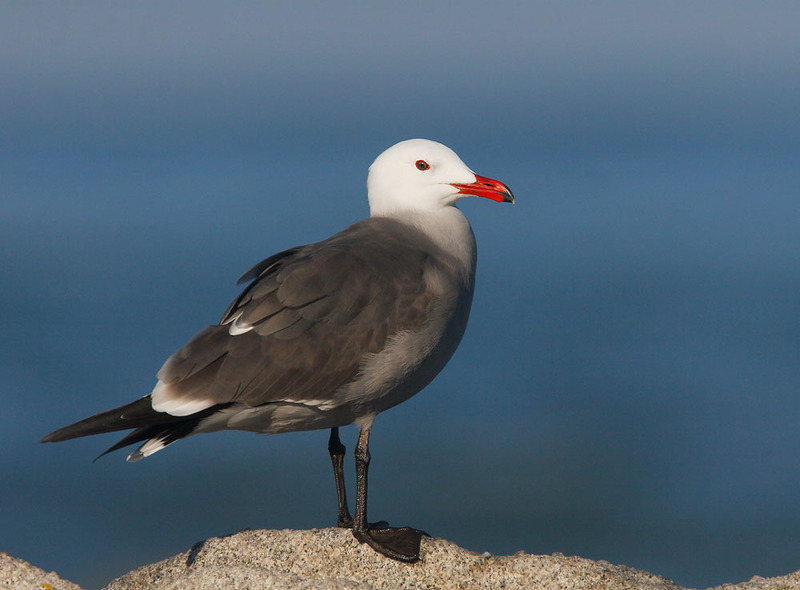 Heermann's gulls are striking gulls. At a glance in flight they look like little bald eagles - white head and dark body. But, of course, they have the unmistakable gull shape and don't have the white tail of a bald eagle. According to Edmonds beach rangers Edmonds is the farthest south in Puget Sound they are found. They don't walk the beach; they stay along the end of the fishing pier and beyond. 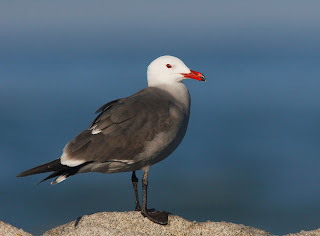 Sitting in my car paying bills in one of the three parking spaces facing the water I heard shrill sea-gull calls and a mature bald eagle came flying at me, first ten then twenty feet off the ground with two sea gulls in chase. After a 30-minute walk during a lucky interval between heavy rain, back at Olympic Beach, as I returned from the fishing pier I saw a harbor seal in very close - very shallow water. Then I looked out and the bald eagle was on a piling 200 feet away. Photo from TGrey Birds. Click to enlarge. You can't make this up. Obama in action. Remember how smart we were told he is? Always the smartest man in the room. Obama's EPA is fining oil companies for not using cellulosic biofuel. But cellulosic biofuel is not being produced. So what might a rational administration do? OK. We have to wait until January, 2013 for that. If Obama's EPA was so smart they would produce their fantasy cellulosic biofuels themselves. Note at the end of the quote below that the NYT says EPA is being lenient - by not fining them even more! Someone in Seattle is interfering with the election in Florida!? Registered Republicans in at least 14 Florida counties have received mailings questioning their citizenship and voter registration. The letter purports to be from the local election official - the election supervisor in most cases - but does not contain their official seal. 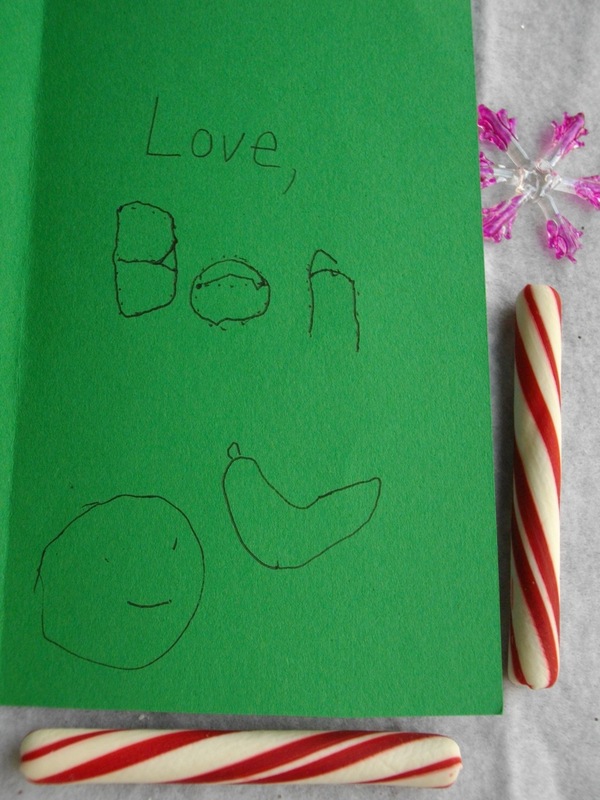 And the envelope has no return address and is postmarked in Seattle. Also it is mailed with a 45-cent stamp, which a government office would not do on a mass mailing. So? The letter doesn't "steal" the voter's vote. But it tells them they are not eligible - to convincer them not to vote. To suppress the votes of Republicans in the swing state of Florida. Much has been made of efforts to suppress the vote in recent months, but this effort is most disturbing. First, it is clearly well-funded and widespread as evidenced by the sheer number of counties and individuals involved, as well as the use of stamps. Second, the effort is targeting a crucial swing state that has been at the center of recent close elections and had elections called into question in the past. Third, the research necessary to conduct such an operation and the money needed to fund the research and stamps to send these letters from Seattle to Florida are enormous. This is not a small effort — it is, in fact, a very calculated and detailed effort needing money, knowledge, technology and a motive to influence the outcome on a grand scale. This is not classic vote fraud - casting a ballot - but is a clear effort to suppress the votes of one side only - the Republicans. And it is a massive effort - fourteen counties! Who is doing it? Is the effort really based here or are they just dropping their mailings here? Michael Gerson of the Wash Post was impressed by Ryan's talk in Demo-heavy Cleveland this week. This was released the same day the newspaper endorsed Obama for four more years of the highest poverty rate in decades and unemployment of 8 per cent. … Romney — admittedly a bit late — sets out a centrist governing philosophy. Both candidates, revealingly, are mainly talking about Romney. Thomas P M Barnett has been watching China. He likes the analysis of a Wall Street Journal article about China. The leaders lead by fear and in fear of their own people. He sees big changes inevitable. Waterspouts formed over North Puget Sound Saturday, October 20, 2012. Photos were taken from the Clinton ferry terminal, from Marysville and Whidbey Island. Benjamin Martin said he was waiting in line at the Clinton ferry terminal when he spotted a water spout form and touch down near Saratoga passage. A couple of the photos were taken by Jennifer Hogan, a trained storm spotter and meteorologist, who just moved to the area last week from Ohio. Weather spotters from the National Weather Service said a waterspout was spotted just off Hat Island in Possession Sound. A man attacked a woman who had anti R-74 signs on her car in a Safeway parking lot in Burien Sunday, October 14. He first tore a sign off her car and tore it up. When another woman got out of her car to help he attacked her and used the strongest racial slur. King County Sheriff's Office says a 23-year -old man was arrested Wednesday morning. “Let me be clear. We condemn any act of this sort and we have been explicit with our supporters — we respect everyone, no matter where they stand on Referendum 74. In fact, we sent an email to our entire list in early September calling for respect and restraint, and another to our staff. Get that? Being attacked is a political tactic. How does one arrange that? That's the only news or statement on the WUFM web site today. This story was not well covered. I didn't see it in my daily news trolling. Hat tip to John Carlson at KVI AM 570. President Obama brags about creating 5 million jobs during his rule. But Rick Santelli of CNBC checked the data and found that Obama forgot to include the jobs lost during his rule. Plus 5 million jobs subtracting 5 million jobs lost equals zero. Zero jobs gained under Obama. The only reason the unemployment rate has dropped is that millions of people have stopped looking for work. When you stop looking you are no longer counted as unemployed. When Obama brags about ho he brought unemployment below 8 per cent after 43 months (3 and a half years) he is bragging about pushing people onto welfare. 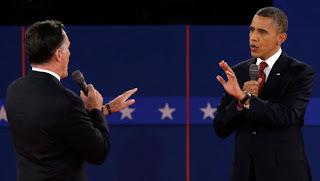 Public Policy Polling, which is left-leaning, now finds that Obama's lead over Mitt Romney in Washington State is only 5 per cent - 50-45 percent. The poll was taken before the second presidential debate. The difference? Independents are now breaking 48-43 percent for Romney. Other polls don't find the race so close. The photo: from CBS. Cross posted at Economic Freedom. Ohio coal miners held a press conference on Friday to tell Barack Obama to quit his lies and mistruths about them. Coal miners at the American Energy Corp. Century Mine said they want President Barack Obama to stop what they term “the war on coal” – and to stop spreading “mistruths” about them. Miners gathered Friday afternoon to express their opposition to Obama’s energy and environmental policies, which they believe threaten their jobs. Miner Mitch Miracle read aloud a letter the miners mailed to Obama that outlines some of their concerns. The miners said Obama’s campaign team is running ads filled with “blatantly false” statements about the miners regarding their participation in Republican presidential candidate Mitt Romney’s August campaign stop at the Century Mine. These ads assert that the miners were forced to attend the event by the mine’s owner, Robert Murray. Murray then hosted the Romney campaign stop in Beallsville in August, during which many miners appeared behind Romney as the former Massachusetts governor spoke about the need to protect coal mining jobs. In response to the assertion some have made about the miners being forced to appear with Romney, the miners made several points on Friday. 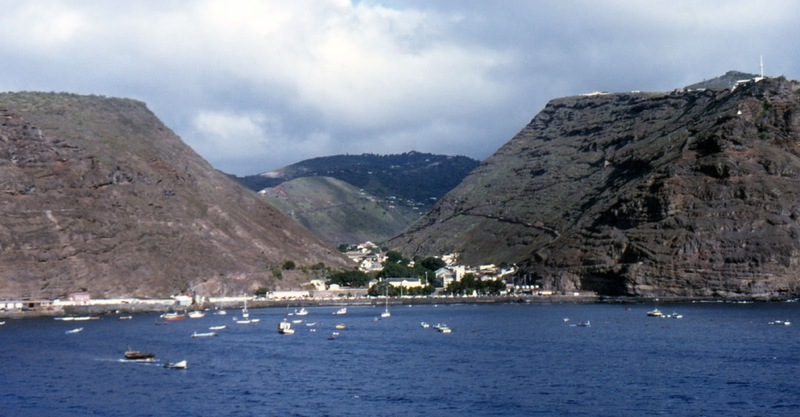 On October 12, 1962 a storm hit with the force of a category-3 hurricane. The term "hurricane" is only used for tropical storms, so this term for this one is non-tropical cyclone. I went on a church trip from West Seattle to a restaurant in Federal Way = The Farm, as I recall. We didn't recognize ourselves in immediate danger; we saw a lot of trees battered by the wind. But we got to the restaurant. I think we ate, then the power went out. Not sure. In one high-school football game, not our own West Seattle High, a punt was negative - went backwards! 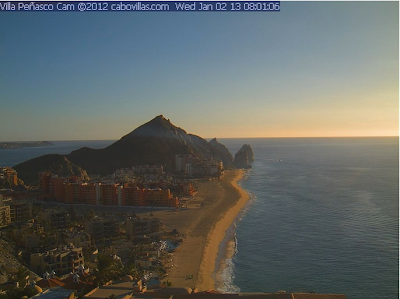 Cliff Mass has the report from the scientific side with data and charts at his weather blog. History Link has the full story. And today's Seattle P-I site. Companion op-Ed by Chris Edwards in WSJ. International trade is very important to Washington - Boeing and aerospace, Microsoft, Starbucks, agriculture and other exports. And imports. And China is the largest trade partner. International Competitiveness Strategy for Washington State. International trade is a key driver of our state's economy.It spans across nearly every industry sector - from agriculture to aerospace to IT to tourism. Based on new research, nearly 40% of all jobs in Washington can be tied to trade-related activity, making our state one of the most trade-engaged economies in the country. Services are an increasingly important part of our trade economy. While it is widely known that Washington is a leader in merchandise and commodities exports like agriculture and aerospace, we are also a growing leader in the export of services such as IT and tourism. The state government has a key role to play. Much of our country's trade policy is set at the federal level, however, state government is crucial to Washington's international competitiveness. Imports mean jobs in Washington state. Although shifting global supply chains cause economic hardship for many people in the U.S., imports also help employ many Washington residents - because of our state's role as an Asian gateway and as the home to a wide diversity of retail and manufacturing headquarters that leverage global supply chains. Washington's international engagement goes beyond imports and exports. Foreign direct investment provides capital for our state's businesses and infrastructure, as well as direct employment for Washington residents. Immigrants and foreign-born residents strengthen our workforce, drive innovation and bring with them connections to our trading partners. There are steps we can collectively take to increase Washington's international competitiveness. The strategy provides six recommendations that will have the maximum impact on increasing the ability of Washington businesses and organizations to successfully engage internationally. The Seattle Times endorsed McKenna for governor three months ago; they repeated it on Saturday. He has proven experience in management as state attorney general. And he has a record of working across the aisle with the Democratics. … For eight years McKenna has been the state attorney general, the same job Gregoire had before becoming governor. Unlike a legislative post, it is a management job, and provides much better preparation for the top job in Olympia than being a congressman in Washington, D.C. The difference shows. Since this page endorsed him three months ago, the Republican McKenna has shown a greater grasp of detail than his Democratic opponent, former U.S. Rep. Jay Inslee, on a wide range of issues. People are concerned about jobs, restoring education to full funding and budget sustainability. On every point, McKenna has a superior, substantive plan. For example, McKenna has a clearer idea of how to raise the state’s support of public schools as ordered by the Washington Supreme Court. Inslee has launched a cynical and opportunistic attack on McKenna for his idea of raising the state property tax while lowering local school levies, but offers no solution of his own. Jobs increased much less than employment growth therefore unemployment is down. Huh? But is this credible? The number of unemployed people dropped by 456,000 when only 114,000 jobs were created--well below the monthly average, and below population growth. Sec. of Labor Solis gave Obama the unemployment numbers he wants. But no one believes them. She is highly insulted that she would be questioned. Then she continues her defense with false data - that added jobs were private sector, when they were public.